Where have all the folk songs gone? Community Care Peterborough - Buckhorn Office has organized a night out just for that reason! 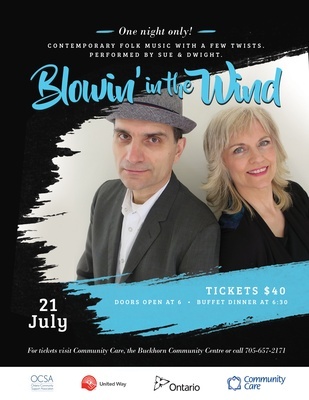 “Blowin in the Wind”- Saturday July 21st at the Buckhorn Community Centre. The evening begins with a great buffet dinner with a choice of beef or chicken and all the trimmings. After dinner, Sue and Dwight will transport us back to the coffeehouses of a 1960’s and 1970’s Folk Revival with songs of peace, hope and social justice that still resonate today. Songs that are folk classics like “If I had a Hammer”, ”Four Strong Winds” and “Five Hundred Miles.” Sue and Dwight are contemporary musicians, songwriters, singers and more. Their songs of the Prairies, life in the big city(TO) and travels to East Africa impart human stories of peace, courage, and social justice in their own Canadian style. Sue and Dwight like to connect with wherever they are. Why not join us in Buckhorn! Tickets are $40 and available at Community Care Buckhorn, Buckhorn Community Centre, and the Buckhorn Welcome Centre.